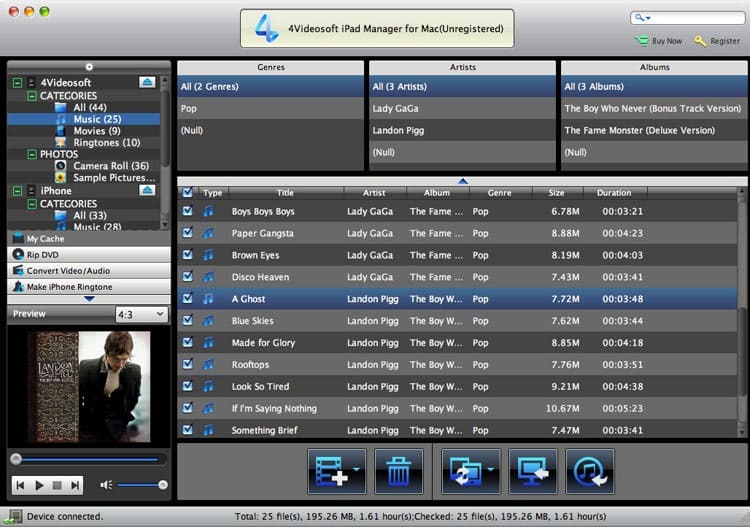 As professional iPad management software, Mac iPad Manager is able to transfer music, movie and photos between Mac and iPad. And it can transfer your Camera Roll to Mac for enjoyment. Besides, it has a powerful function of converting, then you can convert your DVD and video to your iPhone 5, iPhone 4S, iPad 4, iPod and so on. With the Mac iPad Manager, you can transfer your local files such as music, movies, and photos to your iPad, iPhone and iPod. Also, you can back up the iPad files to your Mac. Besides, it supports transferring files among Apple devices. 4Videosoft Mac iPad Manager is able to load DVD Disc, DVD Folder and IFO Files, so you are allowed to rip your DVD movies to your portable Apple devices, My Cache and iTunes library. Converting video is feasible with this iPad Manager, you can freely convert video and audio to your iPad, iPhone and iPod. This powerful Mac iPad Manager allows you to make iPhone Ringtone for your iPhone with popular video or DVD movies. You can choose audio track and subtitle as you like. There is a Merge function that you can join several videos into one. 4videosoft Mac Manager supports to preview source files and you can output all the formats that suit to Apple devices. In order to check your files conveniently, you are allowed to create new playlist and photo album.